First and foremost make the Potato Gnocchi and set aside to be cooked later. Make sure to keep cool and covered. If hot, place inside the refrigerator again covered. Prepare the purple Asparagus by cutting off the bottom 2 inches. Slice the entire asparagus into 3 pieces at an angle. Using a vegetable peeler, peel off the bottom portion of the spear (the top part of the asparagus). Set aside. Clean the Morel mushrooms 3 times in cold water (using new water after sitting for 3-4 minutes). Prepare the garlic and set aside. To make the Mornay Sauce (a Cheese Bechamel Sauce), start by cooking the butter and flour in a small sauce pot on med-low. Increase the heat to med-high and gradually add the milk (in 3 parts). Start whisking immediately so there are no clumps in the bechamel. Season with salt/pepper & start gradually adding the stock while whisking so you have a smooth sauce. Reduce heat to medium-low. Add the cheese and whisk thoroughly until melted and incorporated. Taste and adjust seasoning if needed. Turn heat off and set aside. Place a large pot with water on high heat and bring to a boil. Season liberally with salt. Cook 20-30 gnocchi at a time so as not to crowd the pot. They will let you know when they are cooked because they will pop up to the surface. Fish them out of the water a few at a time with a slotted spoon. Have a large, warmed platter ready with some of the Mornay sauce (made above) you’ll be serving. Place them in the platter and continue cooking in batches until they are all done. Gently toss with more sauce but don’t overdo it as it should be a light dressing. Place a saute pan with 2 tbsps. EVOO on high heat. Once it starts smoking, immediately add the garlic and cook 30-40 seconds. Immediately add the mushrooms and saute another minute. Season with salt/pepper. Finally add the asparagus pieces and cook only until warmed through (1-2 minutes). Remove from heat and set aside. 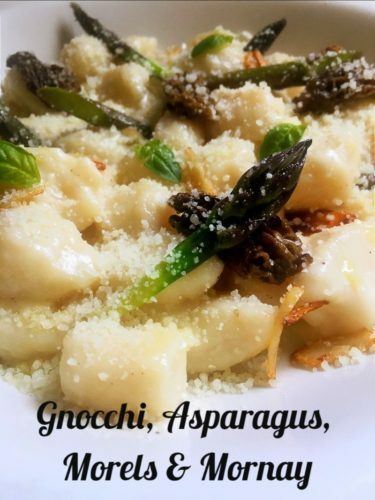 Serve the dish by placing 15-20 gnocchi onto a plate. Place some Mushrooms, Garlic & Asparagus on top. Garnish the plate with Basil leaves and a good sprinkle of Pecorino Romano cheese. Enjoy!